BACKGROUND: Field bindweed is a Eurasian native that has thoroughly naturalized itself in North America. It reproduces both from seed and creeping roots and is found in extremely diverse environmental conditions. Seeds can remain viable in soil for 50 or more years. Field bindweed is agriculture’s twelfth most serious weed species. 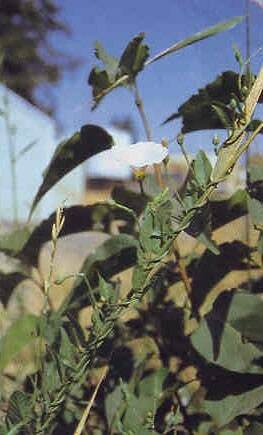 DESCRIPTION: Field bindweed is a perennial vine that dies back each year. Leaves are alternate, up to 2 inches long, and arrowhead shaped. Twisted stems may be 6 feet long, forming dense mats or climbing other vegetation. Flowers are borne in leaf axils from June until September, are white to pink, 1 inch wide, and funnel shaped. A pair of small bracts is found ¼ to 1 inch below the flower. Seeds are hard, triangular, and borne in groups of 4 in a capsule. 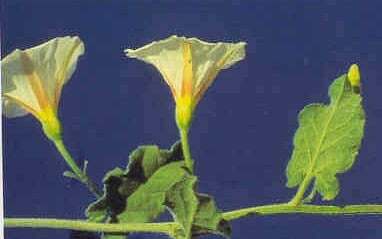 DISTRIBUTION: Field bindweed is found throughout the U. S. except for the extreme Southeast, and southernmost Texas, Arizona, and New Mexico. CONTROL: Biological control agents are unproven, but herbicides can control this weed. Tillage 2 weeks after the plant emerges and continuing every 2 weeks during the growing season over a period of 2 to 3 years will also kill the plant.